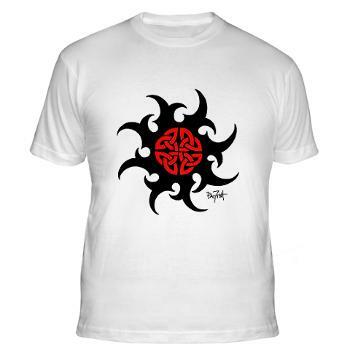 Imagine my surprise when I saw that this custom Celtic and tribal sun design of mine was used in the marvelous film Mystic River. I had read the book by Dennis Lehane, thought it was fabulous, and one day I got an email from a client telling me that he'd seen one of my designs in the movie version of it. I have to admit, I figured he was just talking about a generic Celtic cross tattoo and it wasn't necessarily something I had drawn. So I waited until it came out on NetFlix to watch it. Above, in the two grainy screen captures from one of the last scenes in the film, you can clearly see that MY design has been put on his arm with some kind of theatrical temporary tattoo makeup. Here is a photo of the original tattoo. The design was created in 2001 for a good client of mine who is a sheriff working in the jail system in Riverside, California. 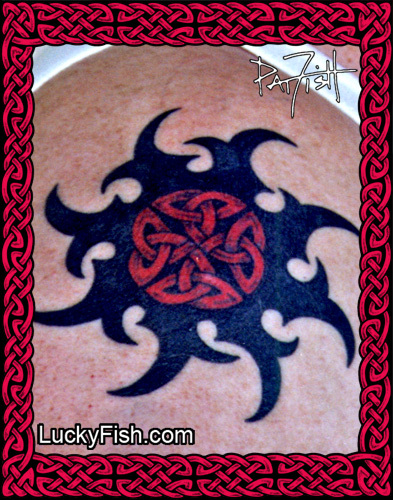 Since that time it has been for sale on my LuckyFishArt tattoo design site, and my presumption is that someone in Clint Eastwood's production company bought the pattern and used it. I'm delighted, and I look forward to the day I get a mention in a movie's credits!! OR a commission to design tattoos for a film! This image available on numerous items in my CafePress store. The image has also been placed on my Cafe Press store so that you may purchase it as a shirt or other merchandise if you like.